Haven’t saved quite enough money for a down payment on a home? How about zero money of your own saved, but your family will gift you money towards a down payment? Or maybe there’s no possibility of receiving a gift of money from anyone in your family – but you still want to buy a house. Is there any hope? You’ll be happy to know there are more paths to homeownership now than ever before. You might qualify for the Freddie Mac Home Possible, or Home Possible Advantage mortgage programs we talked about in this post. Or, you may be eligible for Fannie Mae’s HomeReady mortgage program. These loan programs are designed to help low to moderate income borrowers get into a home with no money of their own. The minimum down payment for each program is as low as 3% of the purchase price, and there’s a lot of flexibility for where you’re allowed to get that money. For both Freddie and Fannie’s programs, the down payment can come from a gift, a community second mortgage, or a down payment assistance program. These sources can also cover your closing costs, too. A total of zero dollars need to come from your money. The bottom line is that by using these programs, you can own a home even if you haven’t saved a dime. Borrowers don’t need to be first time home buyers. Both allow a non-occupying borrower – which means someone who is on the loan with you but doesn’t live in the home with you. Minimum down payment is 3%. Mortgage insurance can be permanently canceled once there’s 20% equity in the home. You can qualify without a credit score at all. Requires at least one borrower to complete a homeowner education course. Can’t earn more than the Area Moderate Income limits. So why choose one program over another? Well, it turns out there are several differences between these programs. Read on for details on the Fannie Mae program, because it may make the difference for you. One of the most challenging hurdles in qualifying for a mortgage is earning enough income to meet the debt-to-income ratio maximums. And, the Area Median Income limit in your county might be to low actually to qualify for the mortgage you’ll need. But with Fannie’s program, there are multiple ways to resolve this. You have to document a prior 12 months of being roommates. If you can only document 9 months of income, it’s averaged over 12 months. The income from the border can’t make up more than 30% of your total qualifying income. You can use future rental income from a granny unit if the property you’re purchasing has a detached unit, or even a “mother-in-law” unit. To have this income included, the lender will need to add a component to the appraisal by including a Rent Comparison Survey. This will give the lender an average for rental income from those types of units in the immediate neighborhood of your property. The mother-in-law unit is not required to be a legal unit for this type of loan program, as long as the appraiser addresses it specifically per Fannie’s guidelines. If the property is located in a low-income census tract, there are no income limits for you. You can still use income other than from your job to qualify. You can use the income of someone not living with you to help you qualify. It’s technically called a non-occupying co-borrower, and you’ll also have to include their debts as well. The lender will add your income together with the non-occupying co-borrowers income, and then add together both of your monthly debt payments (including the future mortgage payment.) They’ll divide the total debt into the total income, and if the ratio is no higher than 45% – you’ll qualify. If you plan on using income from the non-occupying co-borrower, then maximum loan to value is reduced to 95%. Like Freddie Mac’s programs, you’ll be able to have the mortgage insurance removed from your loan once you have reached a minimum of 20% equity in your home. And to prove this, you can either have the lender order an appraisal if you feel there’s been enough appreciation in the property. Or you can wait for approximately three years, so a combination of principal payments and mild appreciation (3% per year) create the 20% equity. But while you are paying the premiums on the mortgage insurance with a HomeReady mortgage, your premium payment will be lower than other borrowers with between 3-10% equity. HomeReady requires a 25% mortgage insurance premium for 90-97% loan-to-value. Standard Fannie Mae loans carry a mortgage insurance premium requirement of 30% for 90-95% loan-to-value, and 35% for 95-97%. And HomeReady allows your mortgage insurance premium to be financed so you don’t have to make a monthly mortgage insurance premium payment. This only works if your loan-to-value (LTV) is no more than 97% with the lifetime premium added onto your loan. But if you have the additional downpayment, it will reduce your monthly payment. 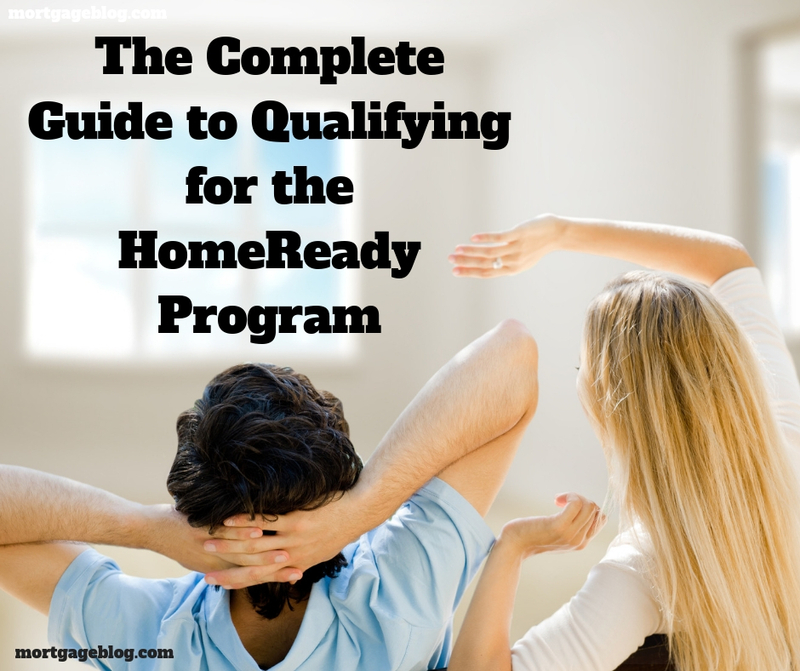 The HomeReady program, like both of Freddies’ programs, can be used to purchase a single family home, a condominium, or a PUD. But HomeReady also allows a 95% LTV purchase of a manufactured home. And if you need to refinance to take cash out of your home later, you can use HomeReady up to a 95% LTV, as long as it’s your primary residence and a single family home. Two borrowers, one with a credit score and one without – there’s no requirement to supply documentation of alternative credit history not reported to the credit bureaus. However, the borrower with the credit score must be contributing more than 50% of the qualifying income. If not, see below. Two borrowers and neither have a credit score means that each borrower must supply two types of ‘non-traditional’ credit documentation. One of the two types should be housing related; however, there’s a hack for that requirement too! If neither borrower has housing-related credit documents, they can still qualify if they can show they have 12 months of the mortgage payment in reserve. The reserves must be funds that are in addition to the down payment and closing costs. These are funds you retain in your accounts and are required to be given to or held by the lender. But you must be able to show that you have direct access to the money in your asset accounts. Non-traditional credit can be utility bills, cell phone bills, storage facility rent, and any other type of regular payment you might be making. Talk to your loan officer about your situation to come up with the required documents. Between these three programs, most borrowers should be able to secure a mortgage loan to be used to purchase a home. While lending standards have not dropped, it’s a priority to open the door to homeownership across the country. Talk to a lender today so you can learn how one of these programs might work for you.